Washington, D.C. fixer Joe DeMarco has been asked to handle a lot of difficult situations over the years for his boss, congressman John Mahoney. But nothing has ever been quite so politically sensitive, or has hit so close to home, as the task Mahoney hands DeMarco in House Odds. 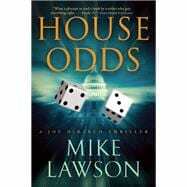 Mike Lawson is a former senior civilian executive for the U.S. Navy. He is the author of seven previous novels starring Joe DeMarco.